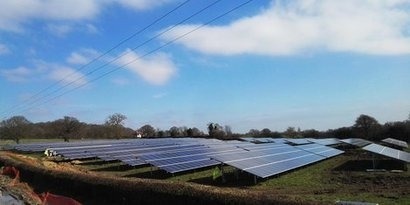 Specialist investment management company Rockfire Capital Limited has completed the acquisition of two solar farm sites in Wales and is actively working on a pipeline of deals for over 200 MW. The two sites, Astley Farm and Pen y Cae, generate in total 10 MW of solar power, which is enough to save over 3.5 tonnes of carbon dioxide a year. The sites produce almost 9.5 gigawatt-hours of electricity each year, equivalent to the electricity supply of approximately 2,400 households in the UK. The sites have been effective from 31 March 2016 and both sites were accredited 1.3 ROCs by Ofgem. Rockfire has worked closely with Warrington Borough Council and the London Borough of Newham on the deal, and the acquisition has also been supported by the London Borough of Bexley. The local authorities involved have been keen to invest in renewable energy not only for the environmental benefits, but also the ability achieve dividend returns that will support their frontline services, which is particularly difficult in the existing low interest rate environment. These investments are an innovative way to generate returns and create new ways for local community infrastructure to be improved without increasing costs to the taxpayer. As well as solar power, Rockfire focus on renewable energy, real estate and private equity investment. These latest deals are part of the firm’s broader strategy of developing the business to become a leading investment management company firm and also growing its presence across Europe. The acquisition adds to Rockfire’s recent successes which include the financing of a solar PV array at a Rolls Royce site in Bristol and the procurement of Swindon Solar Park in September 2016.